Background: Awareness of available treatment devices and methods influences the seeking of appropriate treatment. With the lack of prior orthodontic awareness baseline, the present study aims to measure awareness level of various orthodontic treatment options along with ranking available orthodontic appliances and payment options. Materials and Methods: A total of 350 Saudi participants have completed a survey listing various orthodontic modalities next to its images, as well as payment plan options. Likert awareness scale was used to assess the awareness of nine orthodontic modalities and participants were asked to rank the most preferred orthodontic appliance and payment method options. Results: Stainless steel and ceramic brackets, along with clear aligners displayed moderate-to-high awareness levels. However, statistically significant lower recognition of early treatment tools, namely, expander, headgear, and functional appliances was evident (P < 0.01). The studied group has ranked ceramic brackets as first and lingual brackets as least preferred orthodontic appliance (P < 0.01). Conclusions: Community awareness program along with dental practitioners should aim toward improving population's knowledge on dentofacial orthopedic treatments in specific, as per the study findings. Facial appearance and attractive smile have a positive impact on the psychosocial well-being as it increases personal confidence and self-esteem. Children who are teased about their teeth expressed dissatisfaction with their dental appearance and had a desire for orthodontic treatment. Therefore, increased patients' awareness of facial appearance and smile beauty modalities are observed more frequently in daily clinical practice, and orthodontic specialty is not an exception. The provision of orthodontic therapies has increased over the last few decades in alignment with the raise in the level of expectation from dental treatment and longevity reflected by the society. In support of the objective of such seeking, a positive association between orthodontic treatment need and improved quality of life was earlier concluded. In terms of preference of specific orthodontic appliances, Rosvall et al. conducted a survey that displayed various images of orthodontic appliances for rating by a sample of adults. Attractiveness ratings of orthodontic appliance were in the following order; clear trays and simulated lingual appliances, ceramic appliances, ceramic self-ligation appliances, and finally, hybrid and stainless steel (SS) appliances falling as the least desired. Another important aspect of choosing a specific appliance option is its cost. The cost of dental treatment has been of concern for many patients. It was reported to hinder their ability to meet their demanded treatment and fulfill their needs, as it was rated the most significant barrier to receiving dental services., Furthermore, among all the health-care services, dental services were reported to be among the highest in cost. Therefore, different payment methods are usually formed to facilitate the collection of treatment fees and attract additional patients financial segments. This is in agreement with what Walley et al. reported, that the second most influential factor of choosing a dental office is having good payment plans, after the dentist's referral. Most methods in the literature focused on investigating payment methods through insurance and low-income coverage program such as Medicaid. Such studies conclude that adult Medicaid dental benefits are cost-effectiveness, improving dental health among low-income population, and decreasing dental hospitalization expenditure in the long term. Although awareness and preference of orthodontic devices were reported for some international communities  such variables were seldom investigated in Saudi Arabia. Furthermore, published studies usually focus on the importance of financial support channels and improving access to dental care.,, However, it lacks the investigation of patients' preference for self-paid orthodontic installment plans. Therefore, the aim of this study is to measure and compare Saudi participants' awareness level of the most commonly used orthodontic modalities and to rank their orthodontic appliance preference. As a secondary aim, the study investigated available orthodontic payment method preference. A digital survey fulfilling the study objectives was formulated and conducted through many different social media channels with the ethical approval from the College of Dentistry Research Center at King Saud University (Number: E-18-2876). Questions about confounding factors were included, namely, age, gender, province of residency, education level, monthly income, and number of children. If the participant has had prior orthodontic treatment, inquiries were asked about who choose/pay for the orthodontics treatment, in addition to what type of appliance was used and where the service was provided (at government or private clinics). Nine orthodontic treatment options representing the major therapeutic modalities of choice used in daily practices were listed, namely, space maintainers, arch expanders, external growth modification devices, internal growth modification devices, SS/ceramic/and lingual braces, clear aligners, and combined orthodontic-surgical cases. An image was shown next to each one (the images displayed, lingual holding arch, rapid palatal expander, headgear, twin block, the three types of brackets, clear aligner partially and completely inserted, and a pre- and post-treatment extraoral profile photo of a combined orthodontic and surgical case). All images selected were resized and edited to reflect similar dimension and clear demonstration from the standard view. Participants were asked to rate their awareness level using Likert type scale for awareness. It composed of five categories as follows: (1) not at all aware, (2) slightly aware (3) somewhat aware, (4) moderately aware, and (5) extremely aware. Participants were then asked to rank their most preferred orthodontic appliance option. Four listed options included; SS/ceramic/and lingual brackets and clear aligners. Finally, two choices of payment method (A and B) were formulated for fixed appliances and clear aligner treatments (two methods for each appliance). The methods represent the most commonly used installment plans in Saudi Arabia. Payment method A: dictate high down payment and relatively low monthly installment, while payment method B illustrates the opposite. There was a clear note to participants to assume that total cost in both payment methods are equal and the difference lays only in installment amount. The form was forwarded for a review by three senior orthodontic faculties who are in practice in private and governmental health services. The form was updated with their recommendations and got validated on the final form revision. The target sample was Saudi, with access to internet connection and in use of devices that support web browsing, where non-Saudis, and participants under the age of 18 years, as well as dentists were excluded. One-way ANOVA test was used to calculate the sample size indicating the need of 350 participants to be able to detect an effect size of a difference of one, on Likert scale's mean between awareness modality groups, with a power of 95% and level of significance of 0.05. To ensure improved validity and effective response collection, automatic logic mapping was incorporated in the electronic survey to direct participants at four questions about; their nationality and profession, whether they had a prior orthodontic treatment, and at which place they have received it (government vs. private). Using SPSS 22 statistical package, Armonk, NY, descriptive statistics and frequency cross-tabulation were performed. ANOVA test was used to detect statistical significant differences between Likert's scale awareness means of the different nine orthodontic modalities and between the mean ranking of the selected four appliances. This was followed by applying Chi-square test to investigate any statistical significant differences between the distribution of payment method groups' selection. To conclude, Pearson's correlation (PC) was applied to test for any significant correlations between other variables, namely, awareness means, education level, monthly income, type of appliance earlier received, number of children, and payment methods. The targeted sample was achieved as the response rate matched the required sample size of 350 patients who completed the online survey, where males constitute for 52.65% of the group. 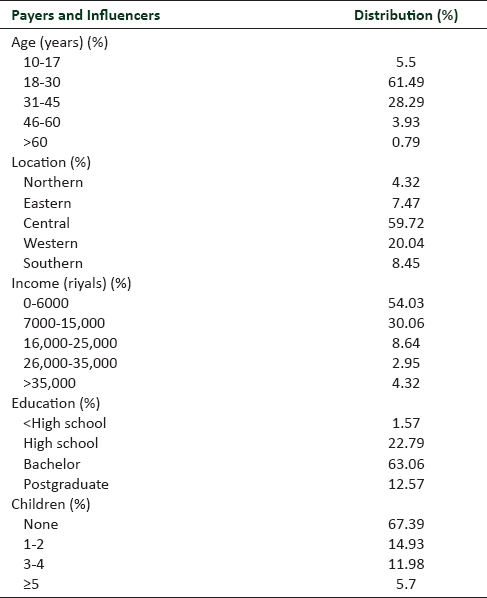 [Table 1] shows the demographic characteristics of the studied sample. Half of the studied samples (50%) have had a previous orthodontic treatment. Of those treated participants, only 12.43% received their treatment at government clinics. 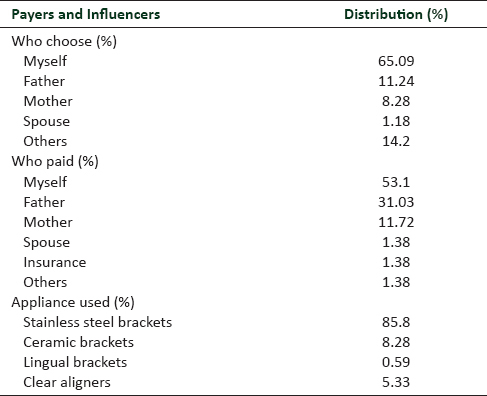 [Table 2] illustrates the distribution of payers and influencers in terms of choosing the clinic/orthodontist, as well as the previously used orthodontic appliances. As for the awareness of selected orthodontic modalities, [Figure 1] shows the mean awareness level of each appliance. Awareness of functional appliances was the least reported, while SS bracket was as expected the mostly recognized. Furthermore, [Figure 2] shows the mean ranking for each one of the four orthodontic appliances selected. ANOVA testing reflected statistical significant differences within both the awareness and ranking data set (P > 0.01). When the two payment methods were introduced to participants, 53.96% and 70.73% have chosen option B, for the SS brackets, and clear aligner therapies, respectively. They favored lower down payment, and higher monthly installments, over relatively higher down payment, and lower monthly installments. Only the later (clear aligner payment preference) displayed statistical significance difference when payment method A and B were compared using Chi-square test (P ≤ 0.01), while the one related to SS bracket did not (P = 0.151). PC indicated significant statistical positive correlations only between education and mean awareness level of functional appliance (PC = 0.128, P = 0.017) and lingual brackets (PC = 0.124, P = 0.02). While monthly income was not correlated with the type of previous orthodontic appliance received (PC = 0.057, P = 0.463). Finally, the more children the participant had the more payment B method (related to SS bracket) is preferred, as there was a statistical significant correlation between them (PC = 0.127, P = 0.021). Earlier studies in Saudi Arabia has indicated that 40% of studied population were in need for comprehensive orthodontic treatment. Other study reported high need of orthodontic treatment reaching 77% of patients attending King Saud University dental clinics. This range is supported by a reported treatment demand of about 40% pertaining to an interviewed sample of Saudis who expressed moderate and advanced need for orthodontics management. Overall, subjective perceptions of esthetic and functional treatment needs were found to be highly variable among the Saudi male patients. The present findings showed that about 50% of the participants have had previous orthodontic treatment which is in harmony with prior reported needs and demand values. Furthermore, the current findings indicated that both parents had contributed almost equally in choosing the orthodontic practice, thus highlighting the importance of considering both, the father and mother, as an influencer in the decision-making process. This prevalence of treated participant reported for other communities showed similar range. The demand for orthodontic treatment among adolescents can reach up to 60% in the general population. This increase in demand has indeed matched an increase in reported patients' awareness, as earlier study indicated high dental awareness level in young adults regarding their preexisting malocclusion status. In a sample of Singaporean's population, 36% of the patients had prior orthodontic treatment and almost half of the group perceived a need for a treatment but did not elect to have it. 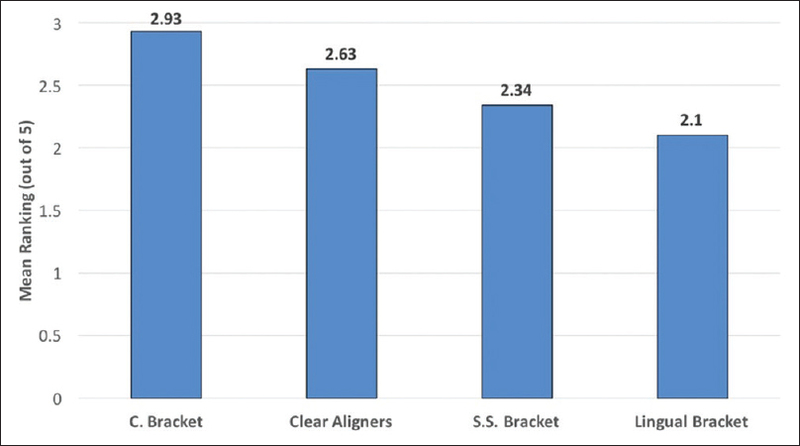 The highest awareness score among orthodontic devices listed was related to SS bracket. Similarly, ceramic bracket and clear aligners were among the highest recognized by means of awareness scale (2.9 and 2.78 out of 5, respectively). A group of preadolescents has earlier expressed approximate moderate level of awareness regarding orthodontic procedures. In connection to this, Adegbite et al. have distributed self-administered questionnaire to medical students. They found that when participants were asked to identify appliances used in orthodontics (including dentures and other removable appliances), only 57.7% have identified braces as a related treatment device. On the other hand, expander, headgear, and functional appliances displayed the lowest level of awareness. A study of Iranian patients showed that although 94% have identified orthodontic goal of teeth arrangement using special braces, only 32% were aware that orthodontic treatment can be rendered at any age. This highlights the lacking of specific knowledge aspects for each distinct population group. Therefore, additional education and knowledge transfer channels should be utilized to improve patients' awareness and recognition of various orthodontic service and treatment options. This is crucial as the information about functional appliances therapy availability would stimulate seeking consultations regarding early treatment when needed. Information education packages were developed previously and were found to increased awareness. Furthermore, proving orthodontic patient with information about their procedure before their orthodontic therapy initiation using audiovisual information was shown to have a significant improvement in patient knowledge. Similar to the distribution path of the present survey, positive effect of social media platform was earlier documented as worthy of consideration in improving patients orthodontic information and future compliance. While ceramic bracket was the mostly preferred treatment option (2.93/5), lingual bracket was placed the least in ranking (2.1/5). This contradicts Ziuchkovski et al. findings, where they showed that clear trays and lingual appliances were among the most attractive treatments. Another study has reported similar findings. A possible cause can be related to the expensive fees associated with its local delivery. A survey conducted immediately after the initial visit to orthodontist targeting adult patients and their parents showed that “an office with a good payment plan” was one of the top 3 reasons cited. Same factor reported when orthodontists were asked about factors affecting patients choice of orthodontic practices. Due to such relatively expensive orthodontic fees, the present study showed a trend to favor lower down payment, combined with higher monthly installments, over a higher down payment option. The significant statistical preference of payment method B for clear aligner therapy should alarm clinical practitioners and office managers to consider formulating easier payment plans in an attempt to attract additional patient segment, making their therapy more feasible. This recommendation should be coupled with educating orthodontic residents early about the cost of orthodontic material, as a reported groups of orthodontic trainees were not able to identify the cost of orthodontic appliance indicating a lack of material cost awareness during the residency period. Incorporating financial aspects in training programs would enable orthodontists to participant effectively toward addressing modifying payment plan options. Finally, when payment methods were analyzed, statistical significant correlation was only shown in relation to SS bracket. The more children the participant has, the more likely he or she would choose payment method B (lower down payment). Such significant correlation was evident for SS bracket only, not clear aligner option, due to its lower cost that would attract more demand from those who cannot offer higher fees, and possibly, in this case, had more children with increased financial burden. The majority of an earlier studied sample (75%) has expressed that orthodontic treatment is indeed expensive. The use of modern social media online platform for the current survey has enhanced achieving the targeted sample as the response rates to traditional e-mail surveys have decreased since the late 1980s. On the other hand, response representativeness was emphasized for the internet-based survey as being more important than response rate. The relatively wide inclusion criteria required for the surveyed sample has positively facilitated the data collection with minimal sampling error. However, given its path of distribution, the present survey could have been affected by a potential nonresponse bias as it was open for participants with a wide range of socioeconomic status and educational backgrounds. Therefore, the current findings can be viewed as a general baseline where subsequent population-specific studies could further represent more controlled segments of interest. The studied group showed a moderate-to-high awareness of SS and ceramic brackets and clear aligners, and low recognition of early treatment tools, namely expander, headgear, and functional appliances. 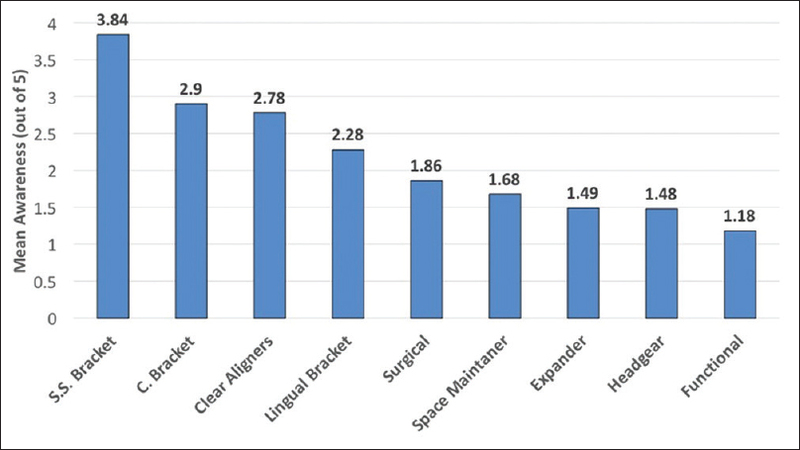 In terms of treatment option preference, ceramic brackets were ranked first and lingual brackets were the least ranked. Educational community program should focus on improving general knowledge of orthodontic appliances, especially the ones concerning early dentofacial orthopedic treatments. The author would like to acknowledge Dr. Waad Alomran for her support in the development of this manuscript. Dr. Mansour Asiry's effort in completion of this project is highly appreciated. Finally, special gratitude to Mr. Muhannad Alghamdi for effectively managing the distribution of the survey to the intended segment widely. Lukez A, Pavlic A, Trinajstic Zrinski M, Spalj S. The unique contribution of elements of smile aesthetics to psychosocial well-being. J Oral Rehabil 2015;42:275-81. Shaw WC. Factors influencing the desire for orthodontic treatment. Eur J Orthod 1981;3:151-62. Lewis HG. Some aspects of orthodontic specialist practice in the United Kingdom. Br J Orthod 1982;9:207-11. Liu Z, McGrath C, Hägg U. The impact of malocclusion/orthodontic treatment need on the quality of life. A systematic review. Angle Orthod 2009;79:585-91. Khan RS, Horrocks EN. A study of adult orthodontic patients and their treatment. Br J Orthod 1991;18:183-94. Meier B, Wiemer KB, Miethke RR. Invisalign – Patient profiling. Analysis of a prospective survey. J Orofac Orthop 2003;64:352-8. Berto PM, Lima CS, Lenza MA, Faber J. Esthetic effect of orthodontic appliances on a smiling face with and without a missing maxillary first premolar. Am J Orthod Dentofacial Orthop 2009;135:S55-60. Rosvall MD, Fields HW, Ziuchkovski J, Rosenstiel SF, Johnston WM. Attractiveness, acceptability, and value of orthodontic appliances. Am J Orthod Dentofacial Orthop 2009;135:276.e1-12. Wall T, Nasseh K, Vujicic M. Most Important Barriers to Dental Care are Financial, not Supply Related. Health Policy Institute Research Brief American Dental Association; 1-9 October, 2014. Yarbrough C, Nasseh K, Vujicic M. Why Adults Forgo Dental Care: Evidence from a New National Survey. Health Policy Institute Research Brief American Dental Association; 1-10 November, 2014. Nasseh K, Wall T, Vujicic M. Cost Barriers to Dental Care Continue to Decline, Particularly among Young Adults and the Poor. Health Policy Institute Research Brief American Dental Association; 1-8 October, 2015. Walley EK, Silberman SL, Tuncay OC. Patient and parent preferences for orthodontic practices. Clin Orthod Res 1999;2:110-23. Choi MK. The impact of medicaid insurance coverage on dental service use. J Health Econ 2011;30:1020-31. Ziuchkovski JP, Fields HW, Johnston WM, Lindsey DT. Assessment of perceived orthodontic appliance attractiveness. Am J Orthod Dentofacial Orthop 2008;133:S68-78. Johnston WD. Orthodontic prepayment plans. Am J Orthod 1969;55:286-93. Brophy JE. Private and governmental programs for payment of orthodontic services. Am J Orthod 1967;53:42-8. Brophy JE. The American Association of Orthodontists and its role in prepayment programs. Am J Orthod 1968;54:683-8. Wade MV. Likert Type Scale Response Anchors. Clemson University: Clemson International Institute for Tourism and Research Development, Department of Parks, Recreation and Tourism Management; 2006.
al-Emran S, Wisth PJ, Böe OE. Prevalence of malocclusion and need for orthodontic treatment in Saudi Arabia. Community Dent Oral Epidemiol 1990;18:253-5. Al-Jobair AM, Baidas LF, Al-Hamid AA, Al-Qahtani SG, Al-Najjar AT, Al-Kawari HM, et al. Orthodontic treatment need among young saudis attending public versus private dental practices in Riyadh. Clin Cosmet Investig Dent 2016;8:121-9. Hassan AH. Orthodontic treatment needs in the western region of Saudi Arabia: A research report. Head Face Med 2006;2:2. Akeel R. Attitudes of saudi male patients toward the replacement of teeth. J Prosthet Dent 2003;90:571-7. McGuinness NJ. Orthodontic evolution: An update for the general dental practitioner. Part 2: Psychosocial aspects of orthodontic treatment, stability of treatment, and the TMJ-orthodontic relationship. J Ir Dent Assoc 2008;54:128-31. Espeland LV, Stenvik A. Orthodontically treated young adults: Awareness of their own dental arrangement. Eur J Orthod 1991;13:7-14. Li TC. A pilot survey of orthodontic awareness among a group of young people in Singapore. Singapore Dent J 2000;23:12-7. Pandey M, Singh J, Mangal G, Yadav P. Evaluation of awareness regarding orthodontic procedures among a group of preadolescents in a cross-sectional study. J Int Soc Prev Community Dent 2014;4:44-7. Rafighi A, Foroughi Moghaddam S, Alizadeh M, Sharifzadeh H. Awareness of orthodontic treatments among school teachers of two cities in Iran. J Dent Res Dent Clin Dent Prospects 2012;6:25-8. Anderson MA, Freer TJ. An orthodontic information package designed to increase patient awareness. Aust Orthod J 2005;21:11-8. O'Brien S, Duane B. Delivery of information to orthodontic patients using social media. Evid Based Dent 2017;18:59-60. Al-Silwadi FM, Gill DS, Petrie A, Cunningham SJ. Effect of social media in improving knowledge among patients having fixed appliance orthodontic treatment: A single-center randomized controlled trial. Am J Orthod Dentofacial Orthop 2015;148:231-7. St Louis BL, Firestone AR, Johnston W, Shanker S, Vig KW. Prospective patients rate practice factors: Development of a questionnaire. Am J Orthod Dentofacial Orthop 2011;139:235-41. Bedair TM, Thompson S, Gupta C, Beck FM, Firestone AR. Orthodontists' opinions of factors affecting patients' choice of orthodontic practices. Am J Orthod Dentofacial Orthop 2010;138:6.e1-7. Hemmings N, Gwilliam J, Bhamrah GK. Orthodontic cost awareness amongst orthodontic trainees in a university teaching hospital. J Orthod 2017;44:110-3. Sheenhan K. E-mail survey response rates: A review. J Comput Mediat Commun 2001;6:11-6. Cook C, Heath F, Thompson RL. A meta-analysis of response rates in web- or internet-based surveys. Educ Psychol Meas 2000;60:821-36.